Need some customized training? We have options for you! Twin Oaks Anesthesia has provided nurse anesthesia programs, as well as multiple hospital anesthesia departments (including Shriner's Hospital for Children in Tampa), with customized Ultrasound Guidance Course taught exclusively by CRNAs. We are committed to providing all professionals in the industry with a sense of confidence through hands-on training in a multi-media rich environment, allowing each professional to realize they too can be proficient with ultrasound guided nerve block procedures as well as the importance of ultrasound in a critical care setting. Let us help you achieve you professional goals! We will provide you with a welcoming and supportive hands-on ultrasound workshop. Dual-screen presentations build a solid foundation of the required evidenced-based text, and simultaneously demonstrate the regional and vascular anatomy. Course costs will vary based on location and content development. Contact us today for a free estimate and let your organization stand out! By the checking the box and completing this form, you are giving Twin Oaks Anesthesia to contact you and/or your organization. Thank you for your interest. Someone will be in touch with you within one business day. 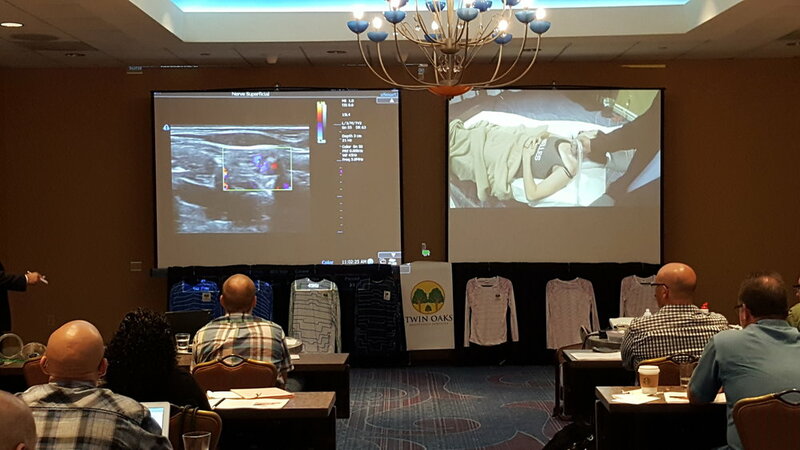 This gives you the opportunity of having a trained instructor, specializing in Terason Ultrasound equipment, come to your institution and provide training on-site in an intimate and safe environment. Contact us today and let us help you stand out as experts in the community! By checking here, you give Twin Oaks Anesthesia permission to contact you through the given information above. Thank you for your inquiry! Someone from Twin Oaks Anesthesia will get in touch with you within one business day.